This is a transcript of SYS Podcast Episode 263: Filmmakers Hannah Barlow & Kane Senes Talk About Their New Micro-Budget Indy Feature Film, For Now. Ashley: Welcome to Episode #263 of the Selling Your Screenplay Podcast. I’m Ashley Scott Meyers, screen writer and blogger over at www.sellingyourscreenplay.com. Today I’m interviewing Kane Sense and Hannah Barlow. They just wrote and directed a small indie drama called For Now. Kane was actually on the podcast a few years ago in #Episode Number 76, which I will link to in the show notes, so check that out if you haven’t already listened to it. And then today we’re gonna hear from Kane and Hannah about how they got this film together and made it happen. So stay tuned for that. If you find this episode valuable please help me out by giving me a review in iTunes or leaving me a comment on YouTube or retweeting the podcast on Twitter or liking or sharing it on Facebook. These social media shares really do help spread word about the podcast, so they’re very much appreciated. Any websites or links that I mentioned in the podcast can be found on my blog in the show notes. I also publish a transcript with every episode in case you’d rather read the show or look at something later on. You can find all the podcast show notes at www.sellingyourscreenplay.com/podcast and then just look for Episode Number 263. If you want my free guide, How To Sell a Screenplay In Five Weeks, you can pick that up by going to www.sellingyourscreenplay.com/guide. It’s completely free, you just put in your email address and I’ll send you a new lesson once per week for five weeks along with a bunch of bonus lessons. 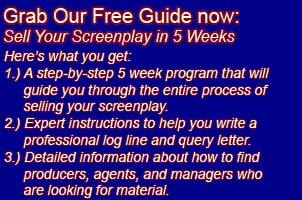 I teach the whole process of how to sell your screenplay in that guide. I’ll teach you how to write a professional logline and query letter and how to find agents managers and producers who are looking for material. Really it’s everything you need to know to sell your screenplay, just go to www.sellingyourscreenplay.com/guide. So now let’s get into the main segment. Today I am interviewing filmmakers Kane Sense and Hannah Barlow then here is the interview. Ashley: Welcome Hannah and Kane to the Selling Your Screenplay podcast I really appreciate you coming on the show with me today. Kane: Thanks for having us. Ashley: So Kane, you were on the podcast before a couple of years ago in #Episode Number 76, so I’m going to refer people to that episode to kind of get your background information. But I thought maybe to start this one we could just get kind of a quick overview, Hannah, of your career, kind of how you got where you’re from, and how you got into the entertainment industry. Hannah: Okay. So I went to sort of the Juilliard of Australia to a university called NIDA. I got an acting degree there, and then pretty much moved to the States when I was 21. And then when I was there, I met Kane at a party and we fell in love, yada, yada, yada and then I was fast forward to being a struggling actor in LA. I got cast in a couple of things, but I constantly found myself wondering what I could be doing with my time other than just struggling to make rent. So, you know, we went to this talk with the Duplass brothers one day and they said their speech that they said at the South by Southwest in 2015 which is basically the [inaudible 00:03:06] and coming. You should look that up, by the way, it’s really good. Ashley: Yeah, I get it. Hannah: And I wrote down this idea for our film for now and then I just said to Kane, let’s go make it, and another friend of ours who’s in film. And then we just made this film. That’s how I sort of fell into filmmaking. Ashley: Okay, perfect. Perfect. So let’s dig into your new film For Now, which you guys both wrote, directed and starred in. Maybe to start out you can give us a quick pitch or logline. What is sort of the premise of this film? Hannah: …Professional ballet dancer. Her brother dances for the Base Shop Ballet Company in Switzerland. So basically the plot is I invite him over to California where I’m living as a struggling actor and we go on a road trip to San Francisco so that he can audition for the San Francisco ballet company, so that we can be closer and that’s the weekend of that trip. Kane: Mumble core to the core. Ashley: I got you. So Hannah where did this idea come from? What was the genesis? It sounds like there’s a lot of pieces in this that are from real life. Did your brother actually have an audition over here at one point? Hannah: He did not. I wanted him to though. When we went to that speech which was held by the Academy in Beverly Hills I think, I was just processing a big road trip that I’d done with my family. We actually traveled through California, up the PCH. And I’d done that with Kane, so I just remember at the time I was trying to, process what it was like to be away from my family for three years, The fact that my brother and I were living on different continents and I just…I had a lot of separation anxiety at the time, but I didn’t realize it and so I was just having to think about if I was to make a film, a self-indulgent film about my life right now, what would it be? At the time it was definitely about that feeling that I was having. Ashley: So you mentioned a lot of the dialogue was improvised. What did you guys actually script before you actually went on the road and started shooting? Did you have the basic beats outlined? How many pages was it and what did that look like? Hannah: So I had to look at that document recently because we had to send out our Kickstarter Awards. One of them was the 30 paged scriptment, so we wrote an outline, which ended up only being actually 22 pages. Hannah: It was like two months. Kane: We only had that time to write our outline, but we kind of decided to embrace that about a few weeks out and just said, “Look, let’s not arbitrarily bridle the dialogue in just to flesh out a script,” because we really wanted to see what this improvised approach could bring. Hannah: Yeah. But just that’s that experimental style of having a clear structure and knowing what you shouldn’t be allowing the actors to improvise on the day so that it feels very real. Kane: Yeah, and I think it helped that we all knew each other quite well, so you know that was either gonna work or wasn’t gonna work. Yeah. Ashley: Yeah. Okay, so like just as an example, like your opening scene you’ve got the…or maybe It’s like the second scene where your friend comes home with a boy she met in a club or guy she met in a club and you guys…like what does that look like just to give us some idea? A girl staying in your apartment brings a guy back to the club, you guys come out you’re trying to get some sleep you start arguing with her, what is what does that look like on the page? Is it just the loose beats written out, and then you’re improvising the dialogue? Hannah: Yeah so it’s like, on the scriptment I think it says, “Catherine stumbles through the front door with Guy, his name is literally Guy in the script. They start making out and then Kane opens his bedroom door. Kane: They get into a fight, he’s trying to get the guy and her to leave, they wanna go to bed they have to get up in the morning. We wrote what happens in the scene but just not who says what and how it happens. So it wasn’t like you know she walks up to him, it was quite loose like that but it did take you through from memory, the beginning the middle and the end of…we knew how each scene had to be resolved. Kane: of each scene, yeah. Kane: Yeah, and each take was played a bit differently, so it became a film that really was found in the editing room as well more than anything. Ashley: And that was gonna be a question. It seems to me that one of the ways of making this work is being able to do 50 takes so you can continuously improvise and kind of let the scene go. It doesn’t sound like you guys had that luxury. Hannah: We had a week to film the whole thing. Hannah: We had long takes and then just did…I mean, Kane’s a great editor, but just a sort of like chunk cut style of editing [laughs]. Kane: Yeah and just kind of the one thing that our cameraman Anton Depre who was fantastic, good, good friend of ours. The one thing he just would ask before each take his just who is this scene focused on? So if I’ve got all four of you, or if I’ve got all three of you, and you can’t…like I don’t know who to be on for what line just in your mind who is this scene about and then I’ll just focus on them. So he really brought a lot in terms of what we’re seeing in any given scene and then we had to just really cut around whatever that long take of his was. Hannah: We really trusted him because he’s just such a talented filmmaker. Kane: Yeah. So we dodged [inaudible 00:11:09] I think. Ashley: Okay, so let’s talk about the actual collaboration of creating this 22 paged document. How did that go? Did you guys sit in the same room and kind of beat it out together, did you go off and write an outline and then came reviewed it or vice versa? Was there dividing up of scenes? How did that process actually work for you guys with the 22 page scriptment? Kane: Well, I mean, it was Hannah’s story. Hannah: feel like…while we were doing the Kickstarter Campaign trying to raise the funds right up until five days before we were shooting, the process was, Catherine and I would bounce ideas off of each other. We’d pass that through Kane, see what he thought. We would continue to brainstorm, we’d write down just general ideas on those study cards, stick them up on the wall. Eventually we had like a hundred cards and then we put that all into a Google Doc. We didn’t even use a final draft [laughs]. Kane: What not to do. Hannah: Cause we couldn’t. Yeah, anyway, and then eventually that became a scriptment that we would continue to work on. Halfway through the writing process which is literally less than two months, Kane and I had to go back to Australia so, we were able to edit from the Google Doc between the two of us and Catherine. Kane: Yeah and I remember at first I stayed out of it. I knew the story, they would come to me just being like look this is what we’re up to. Hannah: Because I’d never written any script before of any kind and he had so. Kane: I was probably the only one of the three that had, but I also wanted to stay out of it as much as I could, at least in early part because I wanted to see what they would come up with. I wanted to see what Hannah would bring from this autobiographical story of hers and I wanted to kind of tell her how that should go. But I’m like a real kind of like structure guy so I came in probably like halfway through the process or something and especially in like the latter part as the shoot approached and we just started to really grind the gears in terms of like making sure that every turning point was as good as it could be and that it was setup so they had payoff. Hannah: And that it wasn’t cheesy, cause then it would’ve have had no substance whatsoever. Like if you’re gonna shoot a film cheaply, the script also like, the scriptment can’t be lame. Kane: and then he jumps in the car and he gives us like this kind of wisdom of life while he’s wedged in the backseat and then we like win. It just kind of was getting a little too like you you’ve kind of seen that before somewhat, so we stripped that back and just said like what happened to us on that road trip, how would this go down if her brother was here. Hannah: And we’d just done that trip like three months before with the family so we just came as closely saying, “Okay, let’s go back to what really happened.” And also you were rereading John Cassavetes. Kane: Which is a fantastic book [inaudible 00:14:50] I believe? Anyway and he just talks a lot about how to just kind of…how to improvise and films that just come from I guess the performer in theater in that sense as much as it does from the kind of writing. Kane: No. We tried to take that approach as much as we could. Hannah: Just because he’s brilliant and one of the best filmmakers of all time. Ashley: So let’s talk about raising the money. You guys mentioned a Kickstarter campaign. Maybe you can talk a little bit about that, maybe some tips some tricks, some of your lessons learned from your experience. Hannah: So the Kickstarter campaign we shot a little short film, just to prep, just to see if we could do this sort of experiment right before we launched the Kickstarter campaign. So I would say just have a little play around with your filmmaking partner just to see if this style works, then we used that video as the footage for our Kickstarter video, yeah. Anyway, it became sort of the reference material in the Kickstarter video itself. Kane edited a video for that and then, once we launched that, and the description of what we wanted on the Kickstarter page, I started doing basically a social media torpedo. So I would arrange what we were posting every day, a bit like marketing, and then we would blast that out to all of our family and friends and contacts literally, like twice a day, every day. Almost like harassing people. Kane: And it came to be like we shot the entire film for what we raised. We didn’t spend a dollar extra. Kane: And we had like almost 300, 270 or something like that. Ashley: Okay, and what’s the gist of how did you build these lists to be able to blast to them every day? It was just literally friends and family? Hannah: Well, we had Facebook and Instagram, and then we compiled an email chain list. And because we are from two different worlds a little bit in Sydney, and then Catherine our co-producer was from Miami, but living in LA, we figured out that we had quite a big network of people that we could reach out to. But we were hounding people. Kane: It’s like I think anytime you do it…I had done one before and because of all the last film that that we spoke about, and yeah. It’s just more so in this case that as we were doing the campaign and it was coming to an end and we’re saying, “Look, like we need everyone’s support we’re going to make this amazing film blah blah blah and we’re going we still don’t really have our scriptment, we still don’t really have a treatment because we’re running this campaign which is really a full time job. Hannah: It was a full time job. Kane: …While trying to while trying to put the film together. And knowing that there was this impending deadline that we only had her brother Connor for a week, and he’s one of the stars of the film. Hannah: There’s also this balance between harassing people and annoying people and doing that. Kane: I’m sure we did both in equal measure. Hannah: We haven’t gotten any complaints, but yeah, just like you have to try and figure out how to get away with it without cutting people off forever. Kane: It’s not really a completely bad thing. It’s not really like not appreciating your Kickstarter game and your harassment. Please leave me alone and take my $10. Anyway. Ashley: Maybe. So did you guys do a typical 30 day Kickstarter? Ashley: So then did you have two pieces of content, like you said, twice a day, you would blast out to these lists. Did you like prepare two pieces of content, so you basically created like 60 pieces of content and when did you create that? Just as it was going every day you tried to come up with two new things to say? Hannah: It got more intense, but I took photos, the photos that we took during our family holiday months before and then screen grabs from the little short experimental film that we shot for the Kickstarter campaign. I just took more than 60 of those and post them every day. And so every time I key backer would back the project we’d do a shout out on Instagram, Facebook and Twitter, so it sort of gave us an excuse to constantly post. Kane: Yeah, and just throwing images in there and putting some text over the top of that, over the videos or whatever. I mean, just the more you can do that, as opposed to just text the better. Ashley: So how did you manage this though? Hannah, since you’re the one doing this, did you have access to Kane’s Instagram and you mentioned the other woman from Miami, did you have access to her Instagram? Kane: Now, we had to sit on our own but we’d share whatever you generated. Ashley: I see. He would share to yours and then they would share it from that. Hannah: Yeah, so between Catherine and I, we were posting twice a day. Yeah. Hannah: I think you were off at that point. Kane: No, I was on at that point because when I go back through my feed it’s just nothing but like 30 days left, 29 days left, 28 days left and I’m like, wow, this this really was my entire life for one month. Hannah: You weren’t really say that on Facebook or Instagram anymore because I think after the fact I deleted it all. Kane: Right. Well, no one’s gonna go looking for it. Just in case. Ashley: So let’s talk about your festival run for a second. How did you feel that went, maybe just talk about how many festivals you submitted to, if you can give us some sense of sort of how many you got accepted to, and how you think that maybe helped the marketing and promotion of the film. Hannah: We submitted to a lot of festivals, you know, we did that classic thing, we spent more money, probably. Kane: Well, I think when you have something you want to submit it everywhere. We obviously kind of had some targets in mind, but we just blanketed it as much as we could, especially by, I believe the important thing festivals is send it to way you want to go, not just the ones that you hear about and read about. Yeah, those are obviously important, but send it to where you want to go. Also, we tried to send it to where we had shot in California and stuff like that. Hannah: And there’s those, movie maker, top 50, top 20, top 10 film festivals, articles that we were sort of studying at the time just because there are so many of you. You want to make sure that you’re sending your money to a place where you can get accepted. So once we did I think… how many festivals, it was six or seven in total? Ashley: That you got accepted to. Hannah: The film wasn’t ready. Kane: The film wasn’t ready. You start to send these things out when it’s not completed yet, which I always think you should wait. I remember saying, “We’re going to wait until this whole thing is finished.” But it was such an ongoing process we ended up kind of having to do some reshoots I think six months later, which normally you would think we’d be quite well in a post if not done, and we really kind of reshaped the film in that extra day or two that we did. So, really the film was constantly evolving. So a festival that we had sent it to maybe like six months earlier when we had the first parts but there were these you know, title placeholder cards being like, you know, this scene’s gonna go here, and so it really was like a patchwork process. But you’re always so anxious to get it out there that I think in hindsight, you look back and go,” Wow, we really could have just kind of waited to finish the whole thing and then send it.” So I always think that’s the number one thing to think about is what version do you want to be sending and kind of negotiating with your own patience, knowing that these things do live forever even though you want to get it out ,you know, straight after you’ve got a cut. Hannah: When we did get into those festivals, we had an amazing time at Ashland Independent Film Festival? Hannah: Yeah Oregon [inaudible 00:23:42] For Now, for some reason. Kane: They really got down with the mumble core thing I guess. Hannah: And yeah. So we were able to have a run in the US and then Australia and we learned, I mean, I learned so much from doing that about how to pitch your film. I think we’re a little out of practice right now because it’s been awhile. Hannah: I don’t know if we answered your question in any way. Ashley: I don’t even remember what it was. But that was fascinating just to hear you guys talking about the process. So you mentioned that you guys are in Australia now pitching another film. Maybe you can talk about what’s next for you guys, what are you guys trying to ramp up? Kane: Do you want to try pitching this to the internet? Kane: Well it’s about a group of girls that go away for the weekend into the Australian mountains and I almost don’t want to say more. Kane: It starts from that, it starts from that kind of premise that you’ve definitely seen before but it’s got a twist to it. It’s comedic a lot of the time as well. Hannah: I think you were talking to me about how you are having like a little debate with your friend about political correctness. Hannah: Because Australia, like the area that we’re planning to shoot in is just so stunning. Kane: Yeah. And, if you… it’s a small ski resort, but if you go in the off period it’s pretty much empty. So yeah, so that’s where that all came from. Ashley: So how are you finding distribution on this one? Have you started to approach the distributors, and do you get any pushback on the fact that there’s no name cast, it’s mumble core, it’s experimental. Kane: Yeah. Well, now it’s coming out on the twenty-ninth of this month of January. Hannah: Worldwide except for Australia. Kane: Worldwide release, it’ll be out on all the major VOD platforms. So it’ll be out on you know, iTunes, Google Play, Voodoo, Amazon and once we’re out on those platforms for a while then you start to see what you can do with [inaudible 00:28:21] so whether it be like a Netflix or Hulu or whatnot. Kane: Which never really came here like it did in the States. Like if you ask anybody what that is, no one knows what you’re talking about. No one is like they might have seen a film from the Duplass Brothers but they don’t think of that as its own kind of sub-genre and it just never really took off here at all. Kane: But it’s starting to now all these years later. Hannah: So anyway, she’s amazing and she started to talk to distributors in the States and then I got a grant to go to AFM at the end of 2017 and I just went there and I met with all these people and I really liked this guy Jesse at Multicom Entertainment. Kane: Yeah. And, they really seem to get the film. Hannah: Yeah. And he, you know, they were really good conditions [laughs]. Kane: Yeah, they struck a great deal. Thanks Jesse at Multicom. Kane: We basically knew the film was going to… we had our distributor on board about a year ago. Hannah: At the end of 2017. Kane: Yeah, and we were thinking this is gonna come out probably, you know, early to mid-last year and he just said, “Look, if you can wait another 10 months, I’d bet it’ll release at the beginning of next year. It’s quieter.” So you obviously want to hear that as a filmmaker at first because you want to put this thing out. Hannah: Just as we’re launching the next film, it’s like, maddening. Kane: It doesn’t matter how long you’ve had to wait. It’s always it’s still the last minute [laughs]. Ashley: For sure. Well, guys, I appreciate all your time today. Thank you for coming on and sharing your story. Of course, when you get your next film done I look forward to seeing that film and talking to you guys again. Maybe just a quick shout out to your social media. You guys mentioned you’re on Instagram and Twitter, any of those handles, just mention those now and I’ll round them up for the show notes so people can click over to them. Hannah: At @Fornowmovie. And then www.fornowmovie.com. Ashley: Perfect. I will write that down. As I said, I’ll grab all that stuff for the show notes. Guys I appreciate it, as I said, keep in touch and we’ll have you on in hopefully less than a year with your next one. Hannah: Thank you so much. Kane: Thanks Ashley, I appreciate it. Ashley: Will talk to you guys later. On the next episode of the podcast I’m going to be interviewing Matthew Brown who just wrote and directed the indie drama called Main. I’ll be talking to him about how he got this film produced, so keep an eye out for that episode next week. To wrap things up. I just want to touch on a few things from today’s interview with Hannah and Kane. I’ve kind of toned this section down over the last few months where I try and highlight a few things that were talked about in the interview. But, I thought there was a number of things that I just wanted to kind of bring out and mention today. I think, mostly I just wanted to take a step back and just really commend these filmmakers who are just going out and making things happen. That’s what I’m all about. That’s what this podcast is really all about. So, you know, that’s a big part of this, getting out there and just doing stuff, even when you don’t necessarily have all the answers or have all the pieces in place. You know, in some ways, if you go back and listen to this interview, or the interview I did with Kane in #Episode Number 75 or 76, I guess it was Episode Number 76. In some ways people might say, “Oh, this is a step backwards, Kane’s other movie was sort of a more traditional movie, he had some name cast in the movie, it was very much sort of a typical production with a shooting schedule, a locked script locations, as they said, name actors and stuff. But, you know, Kane just wanted to keep the ball rolling, took a step back and went and did this sort of experimental script. And again, I just think that’s what people have to do. Everyone has this sort of idea that the trajectory of your career is just it keeps going up, up, up, up and up. I can tell you as someone who’s worked as a screenwriter, I mean, my first project, there have definitely been a number of projects I’ve worked on that have been much smaller projects since the very first script I ever sold. So sometimes you have to just, keep putting stuff out there. That’s why we’re all here hopefully anyways. It’s just to be creative, to be artists and to constantly get stuff out there. So sometimes you just got to be a little experimental. In this case, they didn’t even have like a fully fleshed out script, they kind of had just outlined it in the way that they had discussed. Again, I think that’s a fascinating way to do it. Obviously, this is a screenwriting podcast so that’s not necessarily the way I would recommend that someone goes about doing it, but, it seems to have worked for them. And again, through this experimentation, they’re learning the process, they’re seeing what happens and sometimes you can have these really happy accidents where just getting out there and doing these things can kind of fall into place and come together. They didn’t have all the answers again, they just went out and they figured it out as they went along. Again, it’s just all about making things happen for yourself. Not just sitting around waiting for that agent to call or waiting for that producer to call. Getting out there, making things happen for yourself, doing things on your own, not sitting around waiting for someone to give you permission. And this isn’t just screenwriting either, it goes over to everything that we do in our life. Just being proactive, staying in control of our own careers and our own destiny, is all part of this process, again, of just making things happen for yourself, thinking what you can do to move these projects along without having to rely on a bunch of other people or rely on approval from other people because that approval may or may not ever come. That doesn’t necessarily mean that you’re not fit to do screenwriting or filmmaking. It just means for whatever reason these folks haven’t decided that they want to work with you, but there’s certainly plenty of other people out there who will. If you just show a consistency and a persistence, that sort of hustle, it is contagious and people will see that and people will appreciate that. I can’t tell you how many compliments I get on the podcast and a lot of it is just sheer volume. I’m over 250 episodes and people are just impressed with that, like just that alone, like they don’t necessarily haven’t heard all 250 episodes, but it’s like, again, just being consistent, being persistent, getting a lot of, quality content out there over the course of many, many weeks and months and years. That’s impressive to people, and that’s what people will gravitate to, and that’s how you can kind of get your projects going. And again, maybe that means starting out…you’re shooting a short film on your iPhone and building from there. There’s no real right way to begin this journey, but it just starts with you and making a decision that you’re gonna make things happen. Anyway, that’s the show. Thank you for listening.